LOVE CRAFTS FOREVER: Artist Of The Week. Hello all. 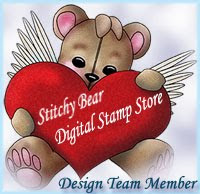 This week at Sweet Pea Stamps we have Artist's Week - Mitzi Sato Miuff. I decided to use rubber stamp Snapdragon Sprit image. I printed out twice and decoupage. I used new shimmer pencils to color, and i don't think i like them. Also i made this pretty flower by using stamps and dies from Heartfelt creations.